The Government of India under National Education Policy of 1986 (as updated in 1992) and the Programme of Action 1992 reaffirm national commitment to universalisation of elementary education (means education upto class eighth). Para 5.12 of NPE resolves that free and compulsory education of satisfactory quality should be provided to all children upto 14 years of age before we enter the 21st century. review from time to time. The activities of the Parishad will be concentrated in selected districts, but may extend to the whole State of U.P. in respect of selected and sponsored projects. The Parishad has been established to function as a societal mission for bringing about a fundamental change in the basic education system, and through it in the overall socio-cultural situation. The following specific objectives of the Project would be pursued by the Parishad. Universalisation of Primary Education, viewed as a composite programme of (i) access to primary education for all children up to 14 years of age; (ii) universal participation till they complete the primary stage through formal or non-formal education programmes; and (iii) universal achievement atleast of the minimum levels of learning. Provision of continuing education and skill development programmes for youth. Basic Education Project started in 1993 covered 17 districts. The project was completed in 2000. The District Primary Education Programme-II was started in 1997 in 22 districts of the state which ended in 2003. Moreover, DPEP-III was started in 32 districts of the state in 2000 and has ended on 31 March, 2006. Janshala project was implemented in district Lucknow during 2000-2003. Sarva Shiksha Abhiyan was started in the state in 16 districts in 2001-2002 and now covers all 70 districts of the state. The Sarva Shiksha Abhiyan intend to achieve the goal of universal elementary education by creating a sustainable and decentralized educational management system and bringing in community participation in all processes of the programme. This being an ambitious challenge for a major social sector development programme in the State whereby decentralization and community participation are being practiced on a large scale. 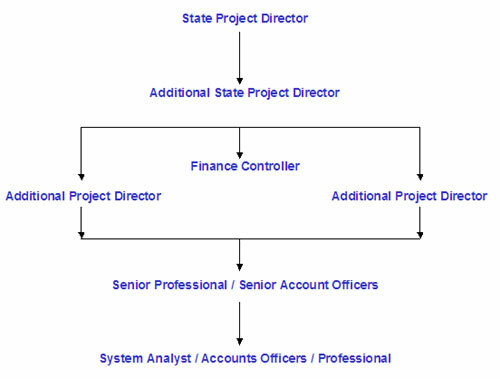 As a response to this enormous task, UP EFAPB has evolved a management structure with a high degree of flexibility in administrative functioning, with mechanisms to establish accountability, provide for smooth flow of financial inputs and above all create a space to experiment with innovative methods & models. In a vast State like Uttar Pradesh with regional variations, the emphasis has been on contextuality, local needs and decentralized planning and the SSA programme provides the administrative/ managerial flexibility to accommodate local needs.